Many patients present with imbalance of the lower third of the face. 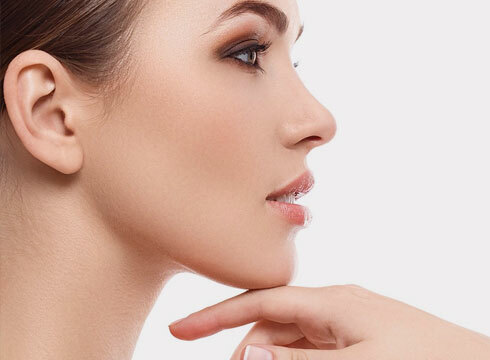 In these patients, the chin is under-developed, making the nose look larger in facial profile. These patients need refining of the nose along with placement of chin implants to achieve a balanced look. A variety of implants are available and differ in size and texture. Choosing the right implant is the single most important factor to determine the most successful result. The implants are usually made of dimethalpolysiloxane, which is a silicone compound that gives a natural look and feel. The best options for you will be discussed carefully with you at your visit. The procedure is frequently done in conjunction with a facelift or other facial surgery, but may be performed as an isolated operation. It is usually done under a general anesthesia, and the procedure takes about one hour to perform. There are different approaches to inserting the implant. These techniques are thoroughly discussed with the patients in order to use the best approach for each person. During the first week of surgery, you may experience different symptoms such as swelling, bruising and some discomfort. It is not uncommon for there to be some temporary numbness in the lip or weakness of the smile. This is usually a result of inflammation and subsides within one to three weeks. After two weeks you may resume normal activities.